Dr. Ifedayo Odeniyi, an Endocrinologist and a Senior Lecturer at the Department of Medicine, College of Medicine, University of Lagos addressing participants during the capacity building workshop on Diabetes in Lagos, recently. Common belief that diabetes is a condition caused by excessive consumption of sugar or certain types of foods were dismissed by scientists who spoke at an event to observe the World Diabetes Day (WDD) on Tuesday. 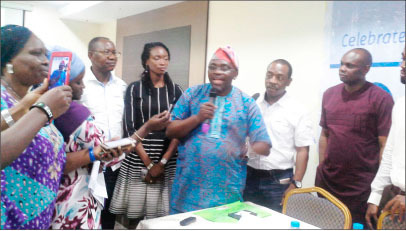 They insisted that “it is not sugar or foods that cause diabetes,’’ at the event which was organised for Health Journalist in Lagos by Sanofi, a global healthcare firm to herald this year’s WDD. One of the scientists, Dr. Ifedayo Odeniyi, an Endocrinologist and a Senior Lecturer at the Department of Medicine, College of Medicine, University of Lagos, explains that diabetes is a problem with the body’s handling of glucose. Odeniyi said; “Most people believe that when you have diabetes, it is because you eat too much sugar, this is not correct. “Diabetes is not as a result of consuming sugar or sugary things, but rather, it is as a result of the body’s inability to handle glucose in the body. “The glucose comes from all the food we eat whether it is meat, carbohydrate, protein or fat; so, in their normal forms, the body does not recognise them. “The only thing the body recognises is glucose as a source of energy; when eat `eba’, `fufu’ foods prepared from cassava, rice and others, the body changes them to glucose,’’ the Endocrinologist said. Odeniyi added: “The body needs glucose for energy for us to move around, eyes to see, brain to function and for every part of the body to function well. “However, before the body can make use of this glucose, one hormone is very important and that is insulin. “After we have eaten and glucose is in the system, the pancreas produces insulin, (which lies on body cells), when the body senses there is glucose in the system. “When it does that, the channel is opened for the insulin to go into the body cell for them to be broken down into energy, carbon dioxide and water. So, insulin can be likened to be the key that opens the door for the glucose to go in. The Senior Lecturer noted that some people might be producing insulin but it is either it was not enough or was not working well enough to allow the glucose to be absorbed into the blood stream. “This is what happens in those that have Type 2 diabetes, so, it is not the food that is causing diabetes,’’ he explained. Odeniyi, who is also an Honorary Consultant Endocinologist at the Lagos University Teaching Hospital (LUTH), also said that it is erroneous to believe that someone with diabetes must be on a special diet. “There is no special diet for diabetes and there is nothing like diabetic diet. “We hear that the diet for people with diabetes should be beans, unripe plantain and wheat. “Diabetic patients can eat everything; the only thing that should change is the quantity of which must be regulated. “There are so many diets but none specific for diabetes; in which ever environment one is, use the food that is culturally accepted to the patient to manage the person. “So, as long you can control the calories, a patient can eat any type of food,’’ Odeniyi said. Making his remarks, Mr. Oladimeji Agbolade, Head, External Affairs, Sanofi, said that diabetes had become a global pandemic. As at 2015, it is estimated that 415 million adults have diabetes and it is expected to rise to 642 million by 2040, Agbolade said. According to him, managing the disease was tedious and time-consuming, but required effective management which would include taking extra care around food and exercise, as well as monitoring of blood levels throughout the day. Agbolade called on the Federal Government to make a policy that would ensure that Nigerians were compulsorily tested for diabetes anytime they went to a hospital. The most common types of diabetes Type 1, a chronic condition in which the pancreas produces little or no insulin, Type 2, a chronic condition that affects the way the body processes blood sugar (glucose). Others are Prediabetes in which blood sugar is high, but not high enough to be type 2 diabetes and Gestational diabetes, a form of high blood sugar affecting pregnant women.